Shifting gears from 1st through 5th is performed in combination with ‘ON and “OFF’ operation of the shift solenoid valves SL1, SL2. SL3 and SL4 which are controlled by the Transmission Control Module (TCM). If an open or short circuit occurs in either of the shift solenoid valve, the TCM controls the remaining normal shift solenoid valves to allow the vehicle to be operated smoothly (Fail safe function). Help us improve AutoCodes.com. Leave a comment below or tell us if the information above help you fix the code. 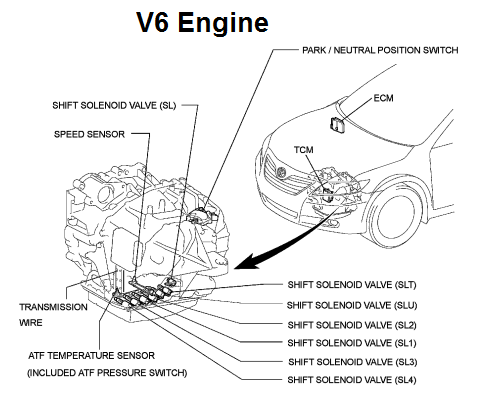 What are the symptoms on your vehicle for the P2810 2007 Toyota Camry code? Have you replaced any parts?